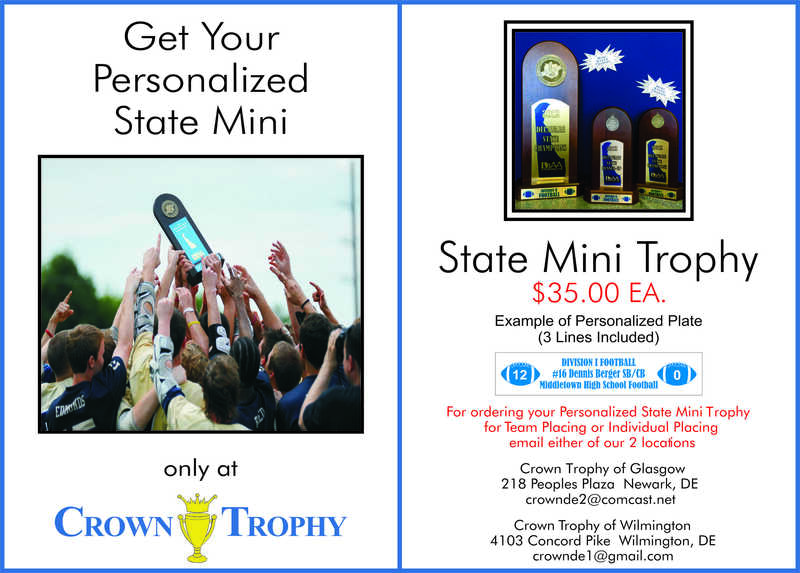 SPECIAL OFFERS: We are proud to inform you that we are selling the customizable mini state trophies. You too can be the owner of one of these, for only $35.00!! If you are viewing our webpage through People's Plaza, you're in luck, you will get a 10% discount towards your total order if you mention this promotion to us in stores or through email. MORE ABOUT Crown Trophy: Crown Trophy is one of America's largest award suppliers, striving for excellence in all we do here. Producing high quality awards at affordable prices and in as little as one weeks time. We take our time with all of our customers making the process of choosing awards as easy as it can be. Here at Crown, the award styles are endless so our showroom can't fit half of the things we can do. But with our one on one customer service we make it all the easier. Our endless supply of awards, combined with great customer service are why we are the sole provider to the one and only DIAA State Trophy. Our moto: "Everyone's a Winner!" ADDITIONAL INFO: Located In-Between Whereabouts CafÃ© & Glasgow Spirits.